I was in Israel - Jerusalem - this spring, meeting up for a holiday with my two longest friends, Irene and Katrin. Irene has been living in Jerusalem for a couple of years. On the first day, after I arrived to glorious sunshine in the morning, we went to the Anna Ticho house. Here, the horizon line is almost right at the top margin of the paper - and what we can see is a highly varied web of lines and markmaking - shaping and filling out the slope of the hills. 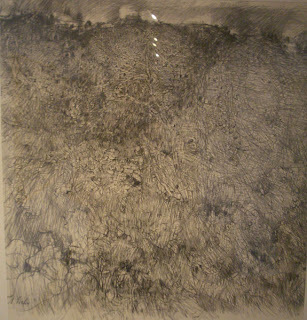 The ridges, in the distance are far less defined and marked with blended charcoal. With much more defined lines that shape tree branches likes spider webs in front of a pale, eery moon, this ink drawing again if full of detail and intrigue. 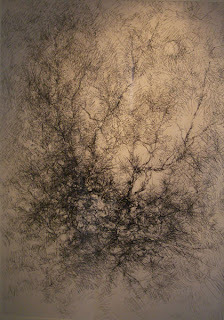 One of the inspiration for the wall textures was an article I read about the artist Sarah Bee . What struck me in her atmospheric landscape of English countryside was the way in which she provides intriguing detail of nature's textures such as hill and cliff slopes, moody pine forests and of standing stones. Many of these have high horizon lines - just take a look at the standing stones for instance. - This, along with the level of detail in the foreground , makes the viewer become part of the scene quickly. I had been grappling with detailed texture for some time before I stumbled across these paintings. 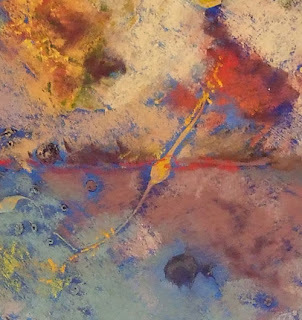 The ways in which they combine acrylics and pastels and explore density and small-scale textures was a true find for me - I ended up taking the article around with me for some time. So far, it has translated into the Textured Walls, but a plein air outing is still waiting to get closer to small-scale patterns in nature. I've used acrylic underpaintings for pastels for quite some time. But I've been keen on exploring what I could do with underpaintings and different kinds of markmaking on these for adding more textual information before painting with pastels. These wall textures have got a lot of splashes of acrylic paints in different colours. - Some with paint straight out of the tube, others diluted with water. The two yellow ones (centre and top left) in this detailed close-up are cadmium yellow undiluted... There are other smaller ones on the mid left in diluted ultramarine. This is the first of so far three paintings on wall textures. Most of my paintings until recently have been landscapes with relatively little detail (maybe bar foreground). Wanting to experiment with more detailed textures and colour changes, I was looking round the studio and found plenty of cracks, fissures and marks on the walls. 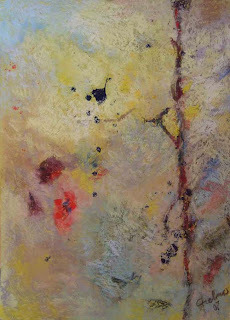 This was the first one of them - it's on board primed with gesso and texture added with pumice powder. Then I applied an acrylic underpainting and various splashes of more acrylic paint on top of that. Lemon yellow as underpainting was quite a discovery too - it offsets and plays with the other, more subtle colours rather beautifully I think. Rather spur of the moment activity had me signed up to a blog... I've been thinking of 'doing something' with my paintings for a wee while , and a website is in the making. However, the idea of something more continuous and informal seems promising. Most of the my paintings are in pastel (see title :)) with a variety of underpaintings and experiments with support materials... Please keep watching to see them developing.